Perm -Tresspassing and annoying other players constantly, I am going to appeal soon! Nice to meet you PREMIUM, i'm Yuu. IM PREMIUM - Thanks for the free donation, @YuuMeep ! The Revival of Meep Builders is now upon us! ANOTHER 100k FROM A VOTE CRATE!!! OMG - I just won 100k from a vote crate! I am on the MeepTimes #56! http://www.meepcraft.com/threads/meeptimes-56.67005/#post-678498! Thanks for your support! I was just interviewed for the biweekly news! Thank you all for your support! onceuponajano, Pmx728 and EllieEllie like this. Just a nice guy chillin' in the world of MeepCraft! Thanks @YuuMeep, i realized i need another couple days or so. I'm very exited! 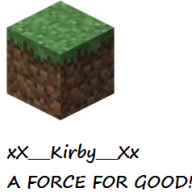 Hello, my name on the forums and minecraft is xX___Kirby___Xx, I am an avid gamer, and I love the game of minecraft. When I first came to the server, I found out that I wanted to stay on meepcraft, and I've been playing since late 2017. I play on other server's too, so try to find me! I wanted to play MeepCraft because it had loads of different elements, such as Towny and Halo. My first time playing minecraft was back in 2010, so I have nice elements on command blocks, minor redstone, and I have had fun on servers too. I have fun on MeepCraft most of the time, and I hope you do too! Anyways, that was me!